There are some people in our lives that touch us in a way that nobody else ever has. I have a few people in my life that just have made such a difference to me that I want to go the extra mile and get them something very special for the holidays. The Pretty Peacock, is the place to go for those people. I always find myself looking and trying get just the right thing without going crazy over budget, or finding something that is too cliche. I like my gifts to be special something that when someone compliments them on it they have to say oh my friend got me this for Christmas isn’t it great! The impact a gift makes after the holidays is just as important as that wow factor when someone opens that gift. I was lucky enough to review something beautiful that I cannot wait to give this season by The Pretty Peacock, it is just the perfect gift for my soon to be daughter in law. 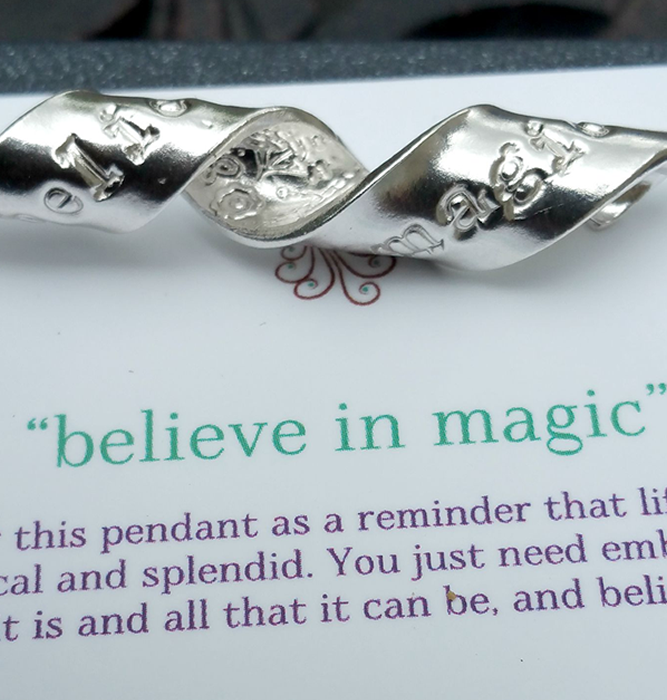 It is from the collection called “Inspirals“, this particular one is called Believe in Magic and it is hand stamped across a spiral of sterling silver. The necklace comes gift boxed and just ready to be wrapped and gifted, it is inspired by the thought that somewhere along the road to adulthood, we stop believing – whether it’s in the tooth fairy, or ‘happily ever after’s… we just stop believing in that special sort of magic that makes our eyes light up and our hearts come alive. But – it is out there. Good things do happen, true love is real, we just have to remember to believe it. The message is awesome it is hand crafted out of sterling silver right here in the USA. At The Pretty Peacock they have so many gorgeous things that will certainly fit the bill for that perfect gift for someone special in your life. Check out their website and don’t forget to connect with them on Facebook, Twitter and Pinterest, you do not want to miss any specials that may be coming this season.